Agrius Rage SV Visor Removal A video by the muppet of destruction on how to remove and refit the visor on the Agrius Rage helmet. Putting A Motorcycle Onto The Centre Stand Sharon's video explains the basics of getting that blasted motorcycles onto it's centre stand. Sounds easy? Not if you've never done it before. Winter Proofing Your Motorcycle Sharon gives her advice on keeping your motorcycle shiny despite the horrors of wintry salt, dirt, rain and frost. There's a lot of cleaning and spraying involved, Ren won't like that. My Opinions On Cold Hands COLD FINGERS! (Queue bond film music...) These are my thoughts on keeping those pinkies as warm as possible through the winter. Tips On Riding A 125 On A Motorway - By Ren Withnell Can you ride a 125 on the motorway? Should you ride a 125 on the motorway? Any tips for riding on a motorway? I'm the chap with the Honda Innova, a new, nervous scooter rider. Has there been any advice in your column about mending a puncture in tyres with tubes? I'm also a cyclist and well used to mending cycle punctures, but the tyres on the Innova, altho' small by motorbike standards are large compared to a cycle. I've bought a set of motorcycle tyre levers - very 'eavy! and I've found that my cycle pump, with patience, can inflate sufficiently to get me to a garage. Hi Peter. The Innova page still goes well. Regarding puntures, there's no quick fix like a push bike. One option is to get some kind of anti-puncture goo put into your tyres, but be sure it's recommended for tubed tyres too. Other than that, like all other motorcyclists, it's either the AA (RAC, Green Flag etc etc) or a lift home off ya mate. Dear Peter Hawker, I have had 4 rear punctures on my innova and it has taken me less than 30 minutes to repair the puncture the way you would with a cycle.I have 3 mettle tyre levers,a small cycle pump and a motorcycle puncture repair kit.I usually remove the back wheel,after the 2nd time it gets easier,and remove the tube the same way as a cycle.Maybe I should do a youtube vid on it, Mick. ps: EP90 gear oil is the finest chain oil known to mankind - I have been using it in an old CBF500 and haven't adjusted the chain for about 11,000 miles !!! Never got finilec to work myself. And the one I carried all over France, Italy and Greece decided to empty itself in a pannier. The mess was enough to put me off ever carrying one again. Although at one time I thought nothing of repairing a tube by the roadside, I'm afraid the breakdown services are my first port of call nowadays. I've used tyreweld and Halfords own brand with very limited but did get us home success. Both times on tubed 125s. I do worry about them "going off" in the top box but I've had worse things happen. As for gear oil being the best chain lube - mix in about 30-40 percent cheap grease and tell me it's not even better. Mixed my second batch of ren's chain elixir. Chain still looks good done 1067 miles on the new chain and still haven't had to adjust it. It sounds better and is very easy to keep clean. Doesn't spray around to much and is simple to apply with a tooth brush. Uses up my old oil Which is eco freindly. I leave the pot next to my bike and apply everyday I return the bike to the garage. No more castrol spray cans for me. I'd be astonished if you had to touch it at that mileage. I've mentioned here before the 955i Triumph Tiger I ran for 20,000 miles. 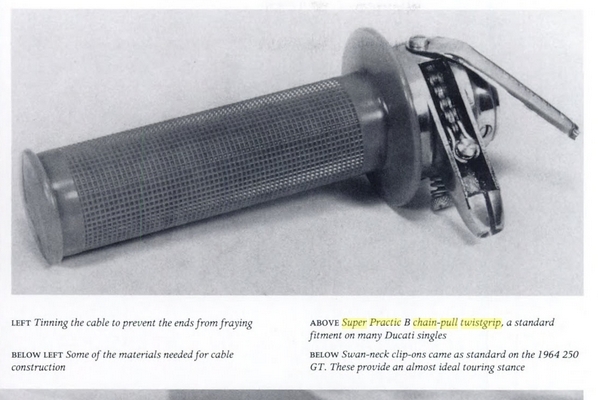 It was on its original chain when I sold it (at around 24,000) and I'd adjusted it precisely once. And I don't think it really needed it then. A check on the length between 20 links showed it well within wear limits. Sole lubrication was Wurth chain wax, and yes I did ride it in the rain. A far cry for the rubbish we used to have that needed boiling in Linklyfe. 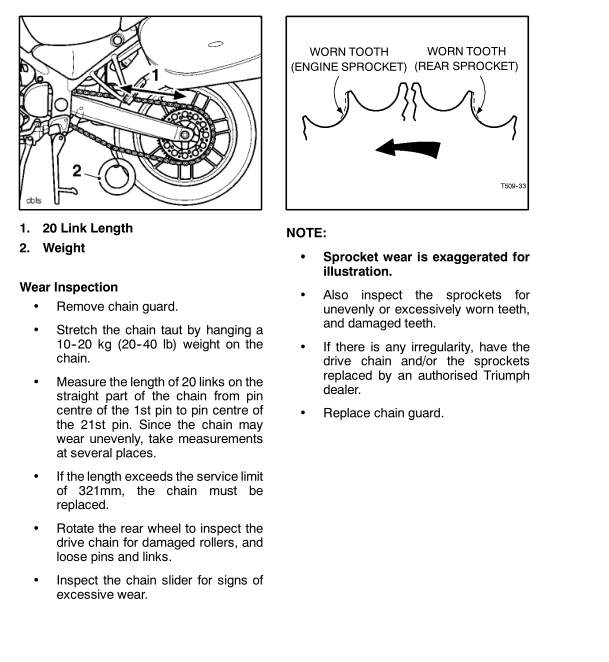 There are SO many factors that affect chain wear. Is the bike used in all weathers and is it used off-road. Single cylinder engines tend to wear chains faster than 4 cylinder engines. Is the chain itself good quality. These things have to be taken into account BEFORE we consider if the lube is any good. That is of course very true. However, you'd expect a bike like the Tiger with oodles of low speed torque to be fairly rough on chains. Chain driven twist grip? It took me a while but I'm guessing it has a better action due to the cable always being pulled in a straight line? Less chance of cable fray too. Correct. They were fitted to BMWs and other expensive bikes but I haven't actually seen one for a long time.